For the last week or so, the temperatures in Las Vegas have been around 115 degrees everyday. Dry heat or not, 115 is hot! Too hot! It makes it hard to get dressed sometime. Since this is my third desert summer, I've learned that the best way to dress in the heat is to wear a simple sundress. They are so comfortable and easy to accessorize in the heat. 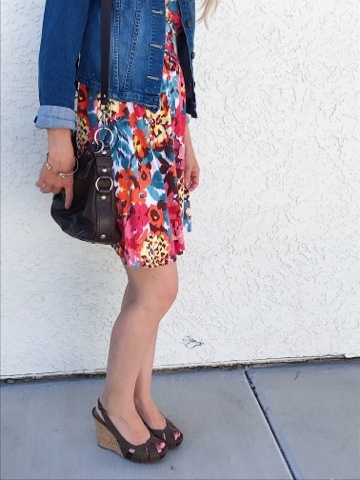 Today, I wanted to share one of my favorite sundresses in my closet. I've had this dress in my closet for years, but when it comes to simple dresses like this, I like to hold on to them. You never know when it will come in handy. I really love the colorful print on this dress. I haven't been able to find anything like it in recent years. I often accessorize the dress with brown. For this look, I wore my brown sling back wedges, brown leather purse and I layered with my denim jacket. You always have to keep something on hand to layer with, because it might be 110 outside, but inside it can be 70 degrees.